Given the strong partisan differences in the trust and use of various news outlets identified in the Center’s other research, this study separately examined the impact of adding news outlet attributions to factual and opinion statements. 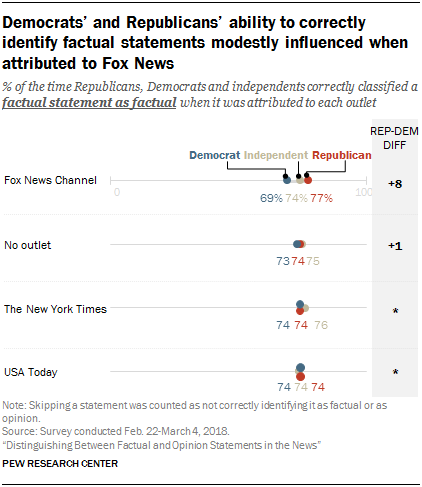 Overall, the attribution had a limited impact, except for one place: Republicans were modestly more likely than Democrats to accurately classify factual statements when they were attributed to Fox News Channel. But there was no influence of this news outlet between parties when it came to opinion or borderline statements. For this part of the analysis, U.S. adults saw a mix of eight additional statements – three factual statements, three opinion statements and two borderline statements – all different from the first round of 12 statements discussed previously. One group – making up a quarter of respondents – was shown all eight statements attributed to no source, while a second group saw each statement randomly attributed to The New York Times (an outlet whose audience leans to the left), Fox News Channel (an outlet whose audience leans to the right) or USA Today (an outlet whose audience is more mixed). 10 The classification of these three outlets’ audiences is based on previously reported survey data, the same data that were used to classify audiences for a recent study about coverage of the Trump administration. For more detail on how this analysis was done, see the Methodology. Overall, as with the initial set of twelve statements, Republicans and Democrats were again more likely to label a claim as factual if it appealed to their side, regardless of outlet attribution. (See the detailed table in Appendix B.) And, overall, the different levels of success in classifying statements seen between the groups discussed in Chapter 2 emerge here as well. The one instance in which the source label showed a modest influence on how members of both political parties categorized the factual statements was when the statements were attributed to Fox News Channel. While members of both parties accurately classified factual statements attributed to Fox News most of the time, Republicans did so to a greater degree (77% of the time), while Democrats did so to a lesser degree (69% of the time).11 Independents fell in between, identifying factual statements attributed to Fox News about three-quarters of the time (74%). In contrast, Republicans and Democrats were about as likely to correctly identify the three factual statements when no outlet was attributed to them and when attributed to the two other outlets, The New York Times and USA Today. Furthermore, the attribution of any of the three outlets had no impact on Republicans’ or Democrats’ classifications of the opinion and borderline statements. Though source attribution in this experiment had a minor impact on responses, other research has found strongly differing reactions to news outlets and widely diverging usage among Democrats and Republicans. So, it is important to keep in mind that this is one experiment within a larger study and that additional research could probe further into when news brands influence perceptions of the news and when they don’t.